The local round of this year's Rotary Youth Speaks competition was a clean sweep for Glebelands School in Cranleigh. Following a preliminary round at Glebelands School to determine which teams would enter the competition, the first round proper was held on Wednesday, 23rd January. Five teams entered at Intermediate Level, comprising three from Glebelands and two from Broadwater School, Godalming. At Senior Level, there was a team each from Glebelands, Rodborough and Broadwater Schools. Following an interesting series of presentations, with topics including social media, veganism and music, teams from Glebelands were declared worthy winners in both categories. The Rotary District 1145 Intermediate Semi-final for 11-13 year olds, organised by Cranleigh Rotary, was held on Saturday, 9 February at Rowleys Community Hub. More than 50 people attended, comprising the students, teachers, parents and Rotarians. Six teams from schools in Surrey and W. Sussex took part, speaking on a wide range of topics, chosen by each team, that included gender stereotyping, teenagers and homelessness. A high standard was achieved by all the speakers, making the judges deliberations very difficult, but, after much discussion, the eventual winners were declared to be Oathall School Hayward's Heath. 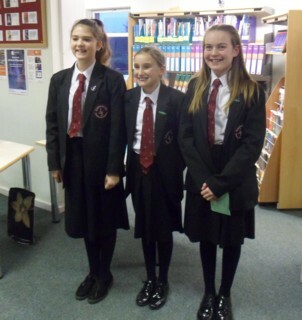 Photo caption: The winning Intermediate Team in the preliminary round from Glebelands School.